On Your Feet! The Emilio & Gloria Estefan Broadway Musical, book by Alexander Dinelaris, featuring music produced and recorded by Emilio & Gloria Estefan & Miami Sound Machine, Scenic Design by David Rockwell, Costume Design by Emilio Sosa, Lighting Design by Kenneth Posner, Sound Design by SDK Sound Design, Projection Design by Darrel Maloney, Casting by Telsey + Company, Wig and Hair Design by Charles G. LaPointe, Music Coordinator Patrick Vaccariello, Music Direction by Clay Ostwald, Orchestrations by Gloria Estefan and Emilio Estefan, Additional Orchestrations by Clay Ostwald and Jorge Casas, Arrangements by Lon Hoyt, Dance Music Arrangements and Dance Orchestrations by Oscar Hernandez, Associate Director Andy Senior, Jr., Associate Choreographers Maria Torres and Natalie Caruncho, General Manager Troika Entertainment and Karen Berry, Choreographed by Sergio Trujillo, and Directed by Jerry Mitchell, runs March 27-31 2019 at the Hanover Theatre in Worcester. You already know Gloria Estefan, the Cuban-American pop star with hit songs such as “Conga” in the late 1980s and early 1990s. 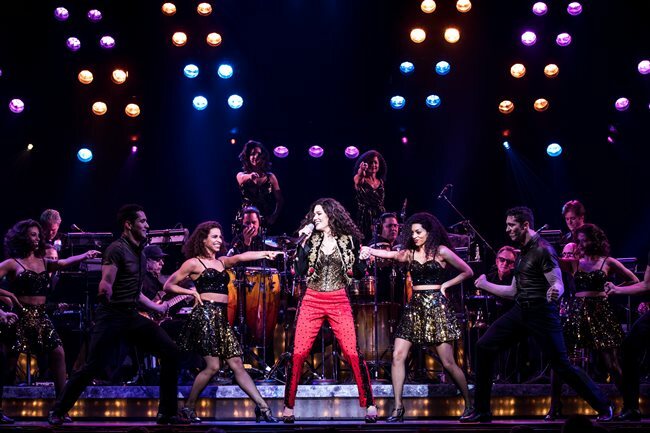 On Your Feet is a musical about the life of Gloria, her husband Emilio, and their group Miami Sound Machine as they rose to prominence. 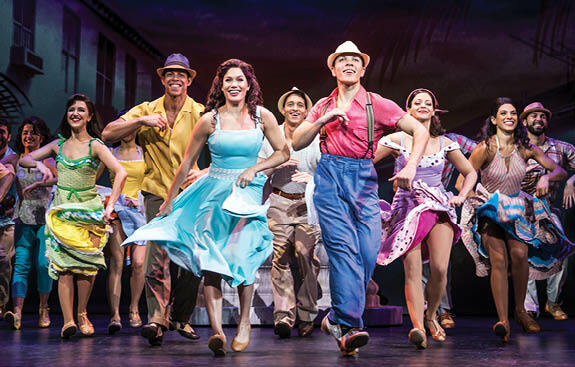 While the show doesn’t reach for heights of drama, the show features a live band of more than a dozen musicians, whose upbeat Cuban dance rhythms will lift any spirits. The show makes effective use of video projection, by Darrel Maloney, in the staging by David Rockwell, creating a background for just a few items of furniture and two tall walls made of louvered shutters meant to evoke the Caribbean heat of Miami or Cuba. Following Gloria’s life from childhood to the peak of her success, the show is packed with big dance numbers with a talented cast of dancers, although the choreography by Sergio Trujillo had few dazzling moments. Kudos to the dancer with the arm tattoos, Jeremey Adam Rey, who seemed to act out the spirit of each scene while he was dancing! Cast changed costumes frequently, with colorful costumes by Emilio Sosa setting powerful visual scenes. Don’t worry, because I’m about to give the show a high 4.5 stars, but On Your Feet is more a good time than a good play. The difference between a biography and a memoir is that a biography enumerates an entire life. Biographies are complete but can be tangled and confusing with no real takeaways, whereas a memoir picks out strands of a life, emotional arcs to emphasize and dwell on. There’s too much enumeration in Out Your Feet, with so many plot points that little time is left for character transitions, or to build drama. For example, 2-minute scenes set Gloria Estefan as a young girl in Miami, and then her father fighting in the Vietnam War, so briefly, in ways that don’t relate to the rest of the play, that there’s little emotional impact on the audience. Conflict makes a story interesting, and if you’ve heard the saying that an author “should set a ticking clock” in a story to enhance conflict, On Your Feet does the opposite by spreading its tale over 20 years. It’s hard to keep up a sense of danger, that something big is at stake, with a story so far-ranging. This is unlike dance musicals Dirty Dancing and Strictly Ballroom, which each take place within a few weeks, and count down to an exciting deadline. It makes me think of the movie Topsy Turvy, which is about stage musical authors Gilbert and Sullivan. Instead of showcasing their entire careers and dozens of theatrical productions, Topsy Turvy highlights a single month for Gilbert and Sullivan when they could have lost it all. The first would be when Gloria and Emilio have been a success in Latin America but are trying to break into the United States market. The Cuban Revolution created a societal backlash against Cubans. Record Producers insisted that Gloria and Emilio change their names and give up their artistic vision where Latin beats are set to English lyrics. Boldly, Emilio says that a mix of English and Latin styles is fundamental to the American people. The crowd erupted with applause when he pronounced, “Whether you like it or not, this is what America looks like!” They say that they will trust their audience to appreciate a new type of music, that Latin Americans won’t reject English lyrics and that white Americans won’t reject Cuban rhythms. They run around performing anywhere at any price, and getting their fans to call up radio stations requesting their music. It’s a wonderful 10 minutes of underdog pride and teamwork that the entire play could have been based on, but instead it is gone too soon. The second powerful moment is when Gloria is crippled by a tour bus accident, and yes, that really happened, and she must struggle to be able to walk again and then face the glare of being seen and pitied by the public. It’s hard for her just to make an appearance on the street, never mind performing! The entire show could have been based during her year of recovery, with flashbacks. The song sung by Emilio during Gloria’s surgery “Wrapped”, is the emotional high point of the show that will make anyone cry. Kudos to Eddie Noel, who plays Emilio with great strength of conviction, a man with a clear vision. Somehow he enhances every scene. The show doesn’t take itself too seriously. It has plenty of self-deprecating humor and lets us laugh at Cuban stereotypes as well as rooting for Cuban pride and passion. That being said, either Gloria and Emilio are superhuman people or the play fails to give them a couple of harmless flaws that would create depth of character. This is understandable in a play that is essentially an autobiography, the two celebrities writing about themselves, but it robs the show of nuance. Gloria gets into a band with her very first audition. The primary tension in Gloria’s physical rehabilitation is that she’s too driven to get better. How about having a human failing where at first she wants to give up, but then becomes resolute through a heartbreaking transition with a musical aside and a learning moment with a profound takeaway that inspires us all? The very first man she dates becomes her husband. He is a perfect man, and they never have a fight. If all that’s true, I accept it! Good for them! But it’s just not very interesting as a story. More importantly, we don’t see a deep yearning in On Your Feet. When Disney makes one of their princess films, they always start with a song, like “Someday My Prince Will Come” in Snow White, that shows how desperately the main character wants to achieve some goal. Then most of the story’s impact is drawn from our empathy with that character struggling with adversity to ultimately win. Although Gloria and Emilio do spend a moment in the middle of the play fighting the music industry, we don’t sense an all-consuming desire for artistic expression that is eating them alive. At the start of the play, Gloria actually seems hesistant about her art, with ambition mainly shown through her grandmother, wonderfully portrayed with love Debra Cardona, who has the best physical comedy of the show. By 20 minutes into the show they are already a success, performing to audiences of 5,000 in South America. The show should not have mentioned their signing a $50 million contract and smugly praising Emilio as a great negotiator. Where’s the possible tension after such riches are openly acknowledged? The show is full of scenes where the story falls flat. In one dramatic turn, after two years of touring, Gloria says, “I’m tired”. Okay, but why have a scene about that? When we meet Gloria’s mom, it’s played for comedy, and then later she’s just not cruel enough for full effect when she opposes Gloria’s wanting to take her son on tour. “Who will take care of the shopping, the house, and your father?” the mother says. First, with $50 million they can’t hire someone for the shopping? Second, wait, Gloria and Emilio have kids now? Either way, the scene was all too brief as the play powered ahead to the next biographic story point. In another scene, Gloria is stressed out about learning a dance step, but then, voila, she learns it. This is not powerful scriptwriting. While music is the strength of the show, sometimes it isn’t harnessed to great effect. When dancers want the audience to clap along, they need to signal this more strongly or the crowd won’t follow. Wonderfully, at one point dancers start a conga line in the audience! But it ends so quickly instead of building to heights. Gloria’s audition piece, “Anything For You”, is a moving and intimate piano solo that’s wonderfully personal — until the full band unnecessarily joins in. At another time, Emilio is broken hearted and alone, possessed by love for Gloria that he hasn’t yet confessed — but then Gloria joins his song! What?! Don’t do that if the emotional purpose of the song is to showcase longing and alienation. Let Emilio have this scene. You know how in most stage musicals, when the characters sing, they’re not really singing in the story? Instead the story stops and the song takes place as a musical aside, a window into their tormented (or glad) hearts. Instead, most songs in On Your Feet are simply part of a Miami Sound Machine performance. The characters are actually performing in the story, which is less impactful than the music being an aside. Despite my complaints and the show’s story being lackluster, the music is its saving grace. My cynicism just couldn’t survive the Cuban drums and happy cheer, the love songs, and the love. Okay, fine, the show is great fun, I admit it! You wore me down, happy musical about nothing. The show is drenched with wholesomeness of the love between Gloria and Emilio. One starts a bit skeptical of or even bored with such perfection, but after a while it is irresistible. There is great good energy in the show, right up to the amazing choreographed ending where actors, while coming out to take their bows, one at a time, each get a shot at singing lead vocals! The story ends at the right time in the Estefan story instead of stretching on and on. Seats at the Hanover Theatre are comfortable with plenty of leg room, and an intermission allows the show to play Gloria’s hit song Conga twice, both before intermission and afterwards. So fine! On Your Feet is an anodyne, inoffensive play that has little tension. It won’t inspire you to greatness, but it is a great time, with Latino pride that will make you cry with happiness at the beauty of the music. With its minor scenes and songs removed to give depth to its major scenes and songs, it could have been the show of the year. As it is, I’ll give 4 stars, okay 4.5 stars, to On Your Feet. For the show and tour information, see onyourfeetmusical.com. And see the Hanover Theatre at thehanovertheatre.org with upcoming shows including Dein Perry’s TAP DOGS, ARRIVAL from Sweden: The Music of ABBA, comedian Kevin James, Foreigner the Hits Tour, John Cusack Live with a Screening of Say Anything, Purple Reign: The Prince Tribute Show, and Waitress the Musical.